With indoor water parks gaining in popularity across the United States, it's no wonder that the Great Wolf Lodge chain of resorts is opening new locations on a regular basis. This fun destination is great for people of all ages and ideal for a family getaway. The first resort was opened in Wisconsin Dells as Black Wolf Lodge in 1997. Its name was later changed to Great Wolf Lodge and the rest is history. 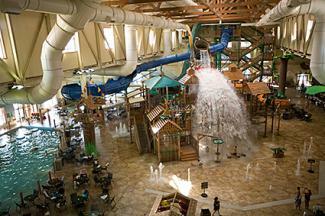 Since Great Wolf Lodge resorts are a chain of indoor water parks, the rustic Northwoods theme and layout are generally the same at each location, with the exception of the square footage the resorts occupy and some of the individual attractions. Resorts typically have between 270 and 400 all-suite rustic-theme rooms, with each one designed to accommodate between six to eight people. Rooms typically include a microwave, wet bar, refrigerator, dining and sitting area. Guests interested in an even more special getaway can book rooms that feature "room within a room" options, including Wolf Den, KidCabin and KidKamp options that have separate bunk areas for children to enjoy during their stay. The size of the indoor water park area depends on location, and can encompass an area of between 40,000 and 100,000 square feet. The main feature of Great Wolf Lodge water parks is a 12-level tree house fort equipped with a variety of water guns, fountains, hoses, bridges and a giant dump bucket that floods the park every five minutes with between 700 and 1,000 gallons of water. Each resort also has number of water slides, with options available for guests of all ages. Water slide styles include body slides and inner tube slides, some of which wind outside of the building. 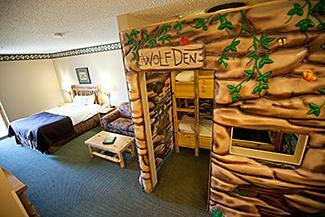 In addition to lodging and the water park area, Great Wolf properties also include other activities and amenities. For example, resort lobbies continue the rustic theme with a large fieldstone fireplace and a clock tower that features an animated show. Supervised children's Cub Club activities. There are some different features among the Great Wolf properties. For instance, some resorts have an outdoor pool area with activities, while some have spa facilities. The Great Wolf Wisconsin Dells location even has an additional outdoor water park called Spirit Island. With new locations opening on a regular basis, Great Wolf Lodge properties are able to provide easily accessible indoor family getaways for families, conveniently located within driving distance of many cities. All season fun: The indoor activities provide a cold weather escape that guarantees a warm water park experience, no matter what the temperature is outside. One-stop destination: The on-site lodging and dining areas, as well as activities, make Great Wolf Lodge resorts an affordable one-stop-shop for families seeking a break from the confines of cabin fever in any season. Inclusive lodging and water park packages: Another benefit of a Great Wolf vacation is the affordable packaging of both lodging and water park fun, since room rates include water park admission for all guests. Keep in mind that pricing will vary slightly, depending on the location. 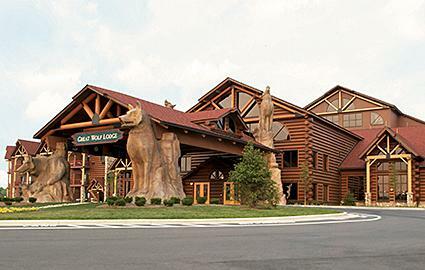 Find the latest promotions on the Great Wolf Lodge deals page. With on-site restaurants, an arcade fitness center, snack and gift shops all under the same roof as lodging and water park fun, Great Wolf Lodge resorts provide an ideal year-round family getaway. Whether you are child or an adult, these resorts have something to offer for everyone.